The 246,000-square-foot Joint Processing Center has 552 short-term inmate beds, offices that manage diversion and re-entry programs, and a medical intake clinic. Houston Mayor Sylvester Turner (first from right) addresses the attendees of the ribbon cutting event for the Houston-Harris County Joint Processing Center on January 31, 2019. 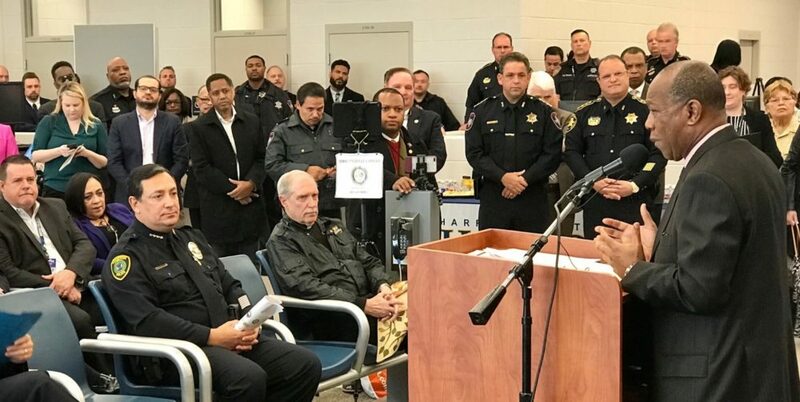 The City of Houston’s and Harris County’s new Joint Processing Center (JPC) will start processing inmates this Saturday, February 2, making that part of the law enforcement and legal process more efficient. The 246,000-square-foot facility is located at 700 N. San Jacinto Street and will eliminate the redundant practice of people arrested by the Houston Police Department having to first be booked into a city jail and then transferred to the Harris County Jail for re-booking. Inmate processing activities that now take place at four different facilities –two city jails and two county buildings– will all take place at the JPC, which has 552 short-term inmate beds. At ribbon cutting event held Thursday, Houston mayor Sylvester Turner noted that the new facility will allow HPD officers to more quickly hand off the people they arrest to jail staff and return to active duty. “When we need more police officers, you know, on the street, this will help to get them back on the street so they can do, handle, what they need to do best,” said Turner. The mayor also said “the people want us to operate in a much more efficient fashion where we can eliminate duplication between the city and the county” and the JPC will serve that purpose. The JPC will house a number of offices, all working together to expedite the administration of justice in an efficient way that lowers the cost to taxpayers. Also housed within the new 3-story building are diversion, re-entry and outreach offices, and a medical intake clinic. Municipal court and county court proceeding will also be conducted inside the building.